Heads Together founder Steven Turnbull at the Dovemount Place headquarters the charity fears it might lose. The future of a Borders brain injury charity is hanging in the balance after a hoped-for £35,000 donation from the National Lottery failed to materialise. Heads Together was relying on that money to go towards the £65,000 purchase of the building in Hawick’s Dovemount Place it is based at. The property will be sold unless those funds can be raised by the end of the year, it fears. Despite now having a sizeable setback to overcome, the charity’s founder and chairman, Steven Turnbull, remains hopeful the purchase can go ahead. 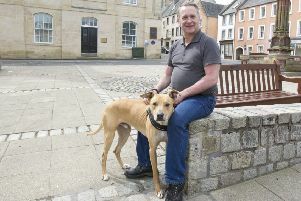 Hawick’s common good fund committee is expected to decide at its next meeting, scheduled for December, if it can help out, and Steven, 56, is waiting for other funding bids to be considered too. He said: “After 10 weeks of thinking that we had a grant from the National Lottery, they rang up to say the lady we had been dealing with had made a mistake and they cannot fund what they indicated they would, that they had pulled out. “I had put an application in for £35,000, and they said they couldn’t help at all. “They say they can’t help with buying the place but they could help with things after we buy it, but the urgency is buying the building because we are running out of time. “We also had hoped that a grant application to Scottish Borders Council would be successful, but now we have been told they can’t help either. “We have £15,000 we raised ourselves, and the common good fund in Hawick, to which we put in a grant application for £15,000, say they are 100% behind us. “However, they won’t commit to an amount until we’re a bit closer to the getting the building. “Their next meeting is in December and we may find out then how much they can give us. “We also have a charity that is coming out to meet us, the Truemark Trust, which we have a £10,000 application in to, and the lady there has told us she will be rooting for us, so I think we may get that one. “There are a lot of applications I have put in that I have not had an answer from yet, so things can change at any time, and I am certainly not giving up. “We are still very hopeful, but after the lottery indicated we would be successful we thought we had nearly done it, so that was a massive blow. The majority of Heads Together’s service users, all suffering various degrees of brain injury, are from Hawick and Galashiels, and Steven says he is worried about the unsettling impact that the charity, founded in 2010, moving to a new base might have on them. “They feel secure here. That’s why we want to stay,” he added.